Last November I wrote an article for The Boston Globe taking a look back at the crisis that faced football in the early 1900s because of the violent nature of the sport (19 players died as a result of gridiron injuries in 1905) and Teddy Roosevelt’s intervention in 1905 to get the leading colleges to reform the sport. It had been suggested to me that the subject would make a good book. The primary source material about TR’s role seemed thin to me, though, and I wasn’t sure how such a book could be structured. Well, now I see how the project could have been executed. John J. Miller delves into this particularly timely topic, given the current spotlight on hard hits and concussions in the NFL, in his new book, “The Big Scrum: How Teddy Roosevelt Saved Football.” Given the limited research materials on Roosevelt's actions in 1905, Miller’s work encompasses a broader timespan, taking a dual storyline of the evolution of football from its early days and the sporting life of Roosevelt from his days as a sickly youth. Still, as a TR buff and a football fan, “The Big Scrum” was an informative and entertaining read, and I definitely learned some new factoids. Even though many say that football is our “new national pastime,” the history of the early days of football hasn’t gotten nearly as much ink as that of baseball. “The Big Scrum” helps to fill that void, and this may be the most engaging part of the book. Miller takes us all the way back to Medieval Europe, whole towns would play a form of football where large mobs played with an inflated pig’s bladder. Hence the term “pigskin.” The tradition continues at the Royal Shrovetide Football Match. Augusta National this is not, however, if you check out the YouTube video. The story of the 1876 Harvard-Yale game, which opens the book, with Roosevelt in the stands as a spectator is a cracker. Yale won 1-0. Touchdowns did not count for points; only the kicks after touchdowns counted if they cleared a clothesline strung between two poles 20 feet apart from 100 feet away. The evolution of rules is fascinating as well. One season safeties did not count against teams. As Miller writes, “A safety mere let [the offensive team] put the ball on their own 25-yard line and start over.” In the 1880 Princeton-Yale game, Princeton took the ball in the second half, took 11 safeties, and never gave Yale the ball. Result: a 0-0 tie. Fun! Makes Ravens-Steelers seem like an AFL shootout in comparison. One other fun factoid: the first Cal-Stanford game in 1892 was delayed for an hour because no one remembered to bring a football. Perhaps the Stanford band entertained the crowd in the meantime. One of the great things about the Internet for any history buff is the ability to access photographs and historical resources that were once buried deep inside archives and libraries. Case in point are the fantastic vintage photographs that the Boston Public Library posts on Flickr. The recent release of baseball photographs taken by Leslie Jones received considerable press, and deservedly so. (Check out this incredible shot of a Cubs player sliding into home at Braves Field.) But I was just as excited to see the recently posted vintage photographs of the Boston Harbor Islands. Check out this photograph taken on Long Island sometime around 1930. It shows the contestants of the annual baby crib race down Long Island Head at the starting line. Gentlemen, start your cradles! OK, just kidding. 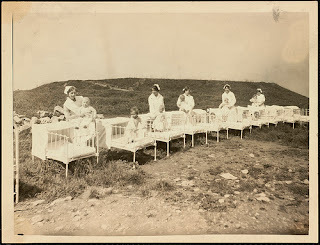 It's a photograph of some of the children who were being cared for at Long Island Hospital along with some of the nurses out getting some fresh air. The cool breezes and the open air of the islands were thought to have salubrious properties. Thus, the Boston Harbor Islands were a place of healing for generations of sick children from Boston. In addition to the hospital on Long Island, the Burrage Hospital on Bumpkin Island provided care and treatment for poor children with physical disabilities between 1902 and the start of World War I. And if you've always been confused as to why the Floating Hospital for Children at Tufts Medical Center is fully landlocked, well, it's because that it dates back to the days when it actually did sail on Boston Harbor. For 33 years starting in 1894, the Floating Hospital sailed the harbor so that its patients could benefit from its supposedly healing breezes.